Exoplanets: Detectable with a camera and telephoto lens. 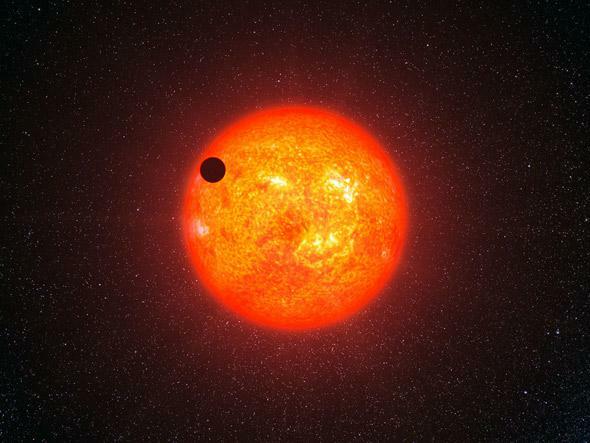 A transiting planet blocks a wee bit of its parent’s star light, and that can be detected here on Earth. Years ago, when the first transiting exoplanet (HD 209458b) was found, I was startled to realize that it could be easily detected using a small, inexpensive telescope. Transiting exoplanets are planets that orbit other stars, and from Earth we just so happen to see their orbit edge-on. That means the planet passes in front of its parent star (that’s the transit bit), blocking a fraction of its light. A tiny fraction, usually far less than 1 percent. But if the star is bright, this dip in brightness can be spotted in small telescopes. I remember doing the calculations and finding that a 30 cm telescope could detect HD 209458b in a single night’s observations. Tough, but possible. That meant an amateur astronomer could detect exoplanets! What didn’t occur to me at the time is that you don’t necessarily need a telescope to do so. David Schneider, an editor at IEEE Spectrum, has described a setup using a digital camera and 300mm telephoto lens that has allowed him to detect the transit of the exoplanet HD 189733b, a so-called hot Jupiter, a massive planet orbiting very close to its star. The transit depth is about 2.6 percent, and his data look pretty good to me. He based his work on an amateur astronomer (vmsguy on the Cloudy Nights forum) who has also posted data that look pretty convincing. Basically, the idea is to take several exposures over the course of the transit, taking care to make sure you get pictures taken before and after the transit. That’s your baseline. Using software to align the images and examine the stars (both vmsguy and Schneider used IRIS, which is Windows only, but other packages exist), you measure the brightness of the star over time to see the transit. Not that it’s that easy! In reality you do relative photometry: You measure the brightness of many stars at the same time, so that a passing cloud doesn’t dim your star and make you think you’ve found an exoplanet. You also have to take other calibrations (like darks and flats), and apply them carefully. But it’s not impossible, and in fact sounds like fun. Mind you, Schneider went all-in, even to the point of building his own gear to track the stars, but if you have a telescope you can always just use the motor drive that does that for you. The point is, you can detect exoplanets using just a camera, a good long lens, and a solid mount! That’s amazing. I’ve been thinking of trying this sometime using my own 20 cm ‘scope; a lot of exoplanets are within range. But I’m still figuring out how to take astrophotographs, and believe me, I know how addicting this can be. I used to do this for a living, and if I get the software and start observing, I’ll be down the rabbit hole pretty quickly! But in some ways, that’s the point. If you have the time and resources, it’s pretty amazing what you can do. You can even observe alien worlds. Tip o’ the lens cap to James Walker.